If your business is involved in experiential marketing, chances are you have hundreds or even thousands of mobile devices out in the field. This could include tablets, corporate phones or even laptops so it's critical that you have a good strategy to manage all of these devices efficiently. Mobile Device Management (MDM) is defined as the securing, monitoring and managing of mobile devices, including phones, tablets, laptop computers and similar electronics. A well-constructed MDM strategy will optimize device usage while protecting sensitive business data as well as the integrity of your corporate networks. For event marketers they should keep in mind these five topics when planning their MDM strategy. One of the first things you need to determine is if you are going to allow your employees (or activation team members) to use their own devices within your network or not (Bring Your Own Device or BYOD). If you allow users to use their devices then you must have a plan in place to install all of the necessary safeguards (anti-virus, password requirements, auto-wipe), without any exceptions. With a BYOD policy you may need to limit the types of devices that are allowed to make your plan more manageable. Other key items for a BYOD policy include clearly spelling out who owns the data on your device or what apps are allowed. This seems like a no-brainer but make sure your access passwords aren't so simple that an outsider can guess them. Its best to create a standard that requires letters, numbers and symbols as well as regularly scheduled password changes. Most devices already contain the ability to automatically wipe the device clean if there are too many incorrect attempts at the password, be sure that feature is enabled. All devices must have up-to-date malware and virus protection. Data security is a major issue and seems to be getting worse each day. Making sure each device has protection installed is only the first step, it won't do any good unless it's updated regularly to protect against the constantly evolving threats. It might be a good idea to invest in an outside company to test your networks security and integrity. There have never been more options in terms of mobile technology. The more variety you have of devices the more difficult it will be to keep them all updated and accounted for. 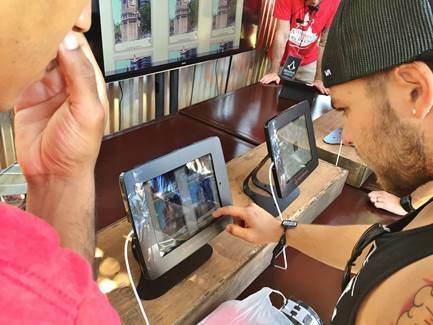 If you are going to be using hundreds of tablets to collect consumer data at events, it will be much easier to manage if they are all the same platform. While it's great to have the ability to use either iPad or Android tablets, it will get tiresome trying to maintain separate software packages. Instead pick the one that best suits your needs and stick with it if possible. For all the precautions you take to keep out hackers and other security threats, maybe the biggest threat is simply your activation team misplacing or losing equipment. What happens if your unlocked device ends up in the wrong hands? You need to be able to quickly remotely lock and/or wipe all data from the device. There are multiple platforms out there, be sure to find one that covers all of your in-the-field devices. By keeping these five points in mind, you will have a more secure and safe MDM plan for your enterprise event marketing.